The first major CS:GO tournament of 2019 is just around the corner as on the 13th of February the action packed IEM Katowice is kicking off! It’s a long event played in three stages known as the “New Challengers”, “New Legends” and “New Champions” with a $1,000,000.00 prize pool to be shared among the best performing teams. In the first stage of the tournament 16 teams will battle it out in a swiss format with a total of five rounds. Half of these teams will be eliminated and half of them will advance to the New Legends stage where 8 of the world’s best teams are already waiting for them. From here another 8 teams will be eliminated whereas the 8 remaining ones will compete in the very last New Champions stage. 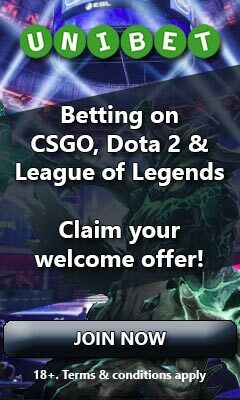 On the 13th the first round of 8 matches will take place in the very first stage of the tournament and some of the best eSport betting sites in the world are already offering odds on these. In the below table we have gathered these odds and made a comparison of them so that you’re able to quickly find the best ones. For your convenience we have highlighted all of the highest ones in yellow. We have also provided you with information of the number of markets that these top rated sites are offering. Please note that the odds and information provided in this article are subject to change. Betway – Cashback on ELEAGUE, up to €25 as a free bet!